Become the ultimate master of Spinjitzu alongside the Ninja of Fire, with THE LEGO® NINJAGO® MOVIE™ Kai Minifigure Alarm Clock. 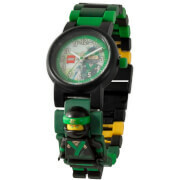 Standing just under 9.5”, the jumbo-sized Kai Minifigure light up alarm clock will watch over you and protect the far-away land of Ninjago from evil warlord Garmadon's takeover. Featuring an easy-to-read digital LCD display, poseable arms, wrists and legs, plus snooze and back light functions, activated simply by pressing down on Kai’s head, you will never be late to unleash the inner power of Spinjitzu.